Heat oil or ghee in a heavy bottomed vessel. Add cardamoms, cloves and cinnamon and saute for a few seconds. Add sliced onions, grated ginger and green chillies and saute for 3 mts. Do not brown them. Add the cubed potatoes, carrots, french beans and salt. Saute for 4 mts. Add 1/2 cup water and cover and cook for 6 mts. 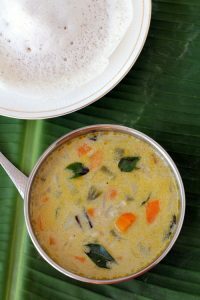 Add the think coconut milk and continue to cook on low-medium flame till the vegetables are almost cooked. Mash a few potato cubes to thicken the gravy. Adjust salt, crushed black peppercorns, cashew nut paste, thick coconut milk and curry leaves. Simmer without lid for 3-4 mts and turn off flame. You can parboil the vegetables and reduce the quantity of thin coconut milk as well as cooking time while cooking the par boiled vegetables. Cashew nuts are purely optional. I have not used cashew nuts in the above recipe. Cauliflower and green peas can also be added. Ginger is essential for the stew. Do not omit it. Coconut oil is generally used to make the stew. I use olive oil.